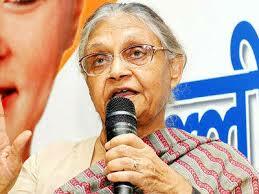 With some opinion polls showing her trailing behind other contenders, Delhi chief minister Sheila Dikshit is set to go interactive on Google Plus Hangout – an instant messaging and video chat platform – with the people of Delhi, particularly the youth, on November 30, three days before the crucial Delhi assembly elections. The hangout would begin around 12:30 p.m. and would last for an hour at the office of Google located in the heart of the city at Connaught Place, party sources said. The arrangements for the Google Hangout have been made by a team of young IT professionals who were hired for the Delhi elections. Dikshit would meet the people through webmedia sitting inside a closed room, Congress party sources said. Dikshit is not known to be Internet-savvy, unlike Gujarat Chief Minister and BJP prime ministerial candidate Narendra Modi, who held a Google Hangout earlier this year and is a frequent tweeter. Google Hangout is an instant messaging and video chat platform, which was launched by Google on May 15, 2013. Dikshit will give answers to questions posed to her by people live through the service on her page. “The conversations per batch of eight would last for around a few minutes, and then the next batch of eight people would be taken up,” said a party source. “The main objective of the exercise is to cater to the youth and answer their queries related to the Congress’ successful rule for the past 15 years,” the source added. A close confidant of Dikshit, 75, said she was an infrequent user of Internet and had not taken to social networking sites. A Twitter page exists of the Delhi chief minister, with her photograph and also those of Prime Minister Manmohan Singh, Congress chief Sonia Gandhi and party vice president Rahul Gandhi. While it has 227 followers, there are no tweets so far.